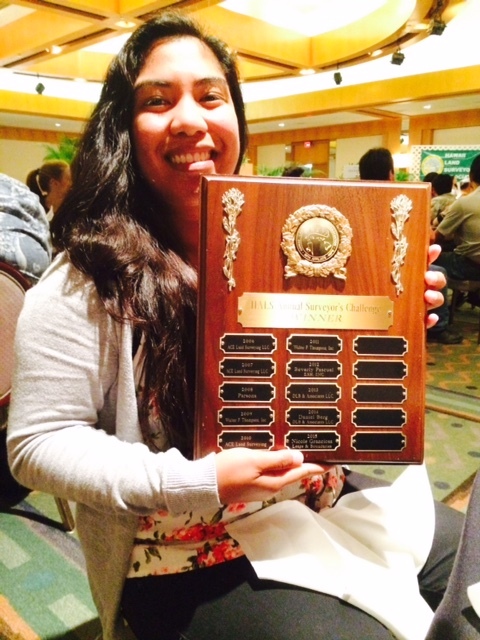 Second semester Construction Management student, Nicole Granciosa, recently won the surveyors challenge at the annual Hawai’i Land and Surveyor Association Surveying Conference that was held on January 29th – 30th, 2015 at the Hawai‘i Prince Hotel. Nicole with the perpetual plaque. The surveyor’s challenge is an annual competition held at the conference. This year’s challenge was to figure out the height and area of the Hawai‘i Prince Hotel ballroom foyer. The person with the closest estimation of the height and area of the foyer to the nearest tenths received their name on a perpetual plaque. Granciosa competed against experienced surveyors as well as licensed surveyors in the state of Hawai‘i. In addition to her studies, Granciosa is also interning at not one, but two agencies – the Department of Transportation, and Leaps & Boundaries, Inc.
Granciosa plans to graduate in the spring of 2016. After graduation she plans to obtain a bachelor’s degree in a field related to construction management. “Honolulu Community College has been a great experience so far. Within a semester I’ve made friends, made close relationships with my teachers, and I was lucky enough to land two internships. The college has definitely made me feel comfortable compared to other UH campuses I’ve attended. Everyone is so friendly and helpful that it feels like I’ve been going to this school for years,” shares Granciosa.